Due to popular demand… Edelbrock is now offering street rodders the ultimate solution for adding dual or triple deuce Edelbrock power! Edelbrock Vintage Manifold kits offer you the core components you need to install a vintage Edelbrock multiple carburetor and intake manifold setup on your Flathead or small-block Chevy. 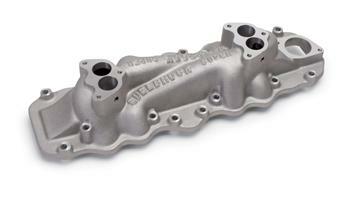 This is a reproduction of the original intake manifold designed by Vic Edelbrock Sr. in 1938. The Slingshot is a real show stopper and even includes stainless acorn nuts for mounting the two halves. Will fit Ford and Mercury engines made from 1938 to 1948. Match with our block letter heads for a classic look. A truly classic race manifold; the Super Dual features 180° firing order, eliminated heat crossover and carb location over port openings. Designed for Ford and Mercury engines made from 1938 to 1948. These reproductions of the vintage Edelbrock manifold #SU 359 and #SU 349 allow the use of three 2-barrel carburetors on 1938-1948 and 1949-1953 Ford Flathead engines. #1109 features front road draft and 1-3/8” diameter oil fill bosses and a raised fuel pump boss. They accept #1151 and #1152 Edelbrock 94 3-bolt, Stromberg 3-bolt (97 type), Holley 3-bolt and Demon 98 carburetors. This manifold allows the use of square-bore carbs such as the Edelbrock Performer Series or Thunder Series AVS 500 cfm on the 1949-1953 Ford Flathead engine. This is a reproduction of the vintage Edelbrock #452 two-piece manifold with a new carb adapter flange. Carb adapter flange also available separately, #1106.